Opening day of gun season 2012 marked a very special day for me. I have loved hunting deer since my father, David, took me on my first whitetail hunt in Pennsylvania at the age of 12. 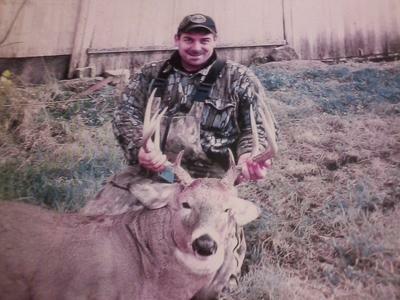 At 14, I took my first New York buck with a bow and arrow, a beautiful 13 point buck that netted 153 2/8. From that day forward my nickname has been "Buck". Through the years I have truly been fortunate, harvesting several big NYS bucks. Having made some bad decisions in life and getting into drugs, my love to hunt faded away. In 2012 I had one year of being clean and my passion for the outdoors started to come back. Friday evening I walked back to my favorite spot and put my borrowed ladder stand up. Opening morning was beautiful, and within 20 minutes, I had two doe under my tree. About 8:30, I heard footsteps, and my heart started pounding. I slowly turned around to see my neighbor walking toward my stand. He looked up and said "Oh, it's you!" He told me his tree stand was 60 yards south of mine, and that I was more than welcome to stay and enjoy the day. I thanked him, but out of respect I realized that during those 7 years of drug abuse, my favorite hunting spot was lost, along with everything else in my life. It was no longer my spot, and I slipped out of the woods so my neighbor could hunt undisturbed. truck and I really felt down. I felt like I ruined opening day for my neighbor, and I had no spot to hunt. I drove to my dad's house, and had coffee with him. He too had also not hunted in a few years due to hip replacements. I decided my mission was to help my dad get a buck no matter what it took. We took a ride up to our family farm and made a plan for me to walk slowly towards him and hopefully get him a shot. As I was still hunting my way towards him, I saw movement out of the corner of my eye. I looked up and saw a beautiful buck leaping over an embankment and running into some very thick brush. I had no shot, and I remember thinking that this was par for the course. He then stopped dead in his tracks from a full run and did a 180 degree turn. He jumped right into the only clear spot around, and offered a perfect shot 147 yards away. I pulled the trigger, and he dropped as if a sledge hammer had hit him. When I walked up to him, I just kept saying, "Thank you God. ", I needed this so bad. The buck weighed 262 lbs on a certified scale, and his 9-point rack netted 143 5/8. I am only sharing this story because I know how it feels to loose hope, and no matter how bad things get, with a little help from God, they can surely turn around! God-Bless! Join in and write your own page! It's easy to do. How? Simply click here to return to Deer Stories Page.